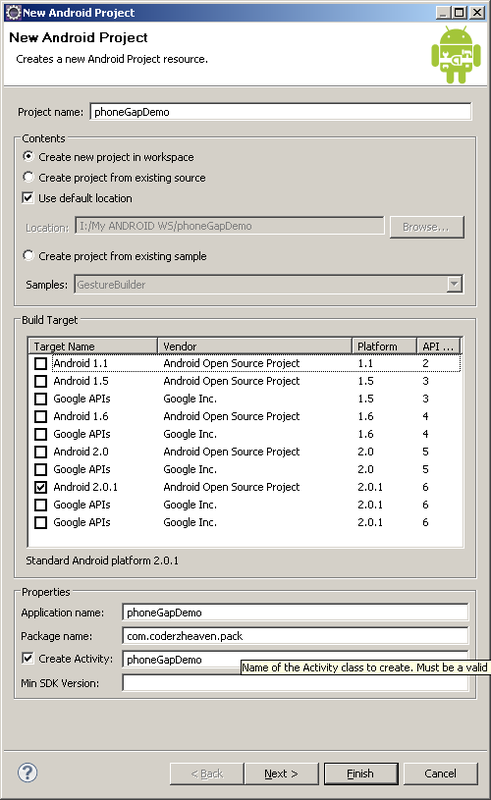 In today’s tutorial I will show how to start with a HelloWorld Application in PhoneGap for ANDROID. Follow these steps exactly to build the helloworld application. For installing eclipse you need to install java. 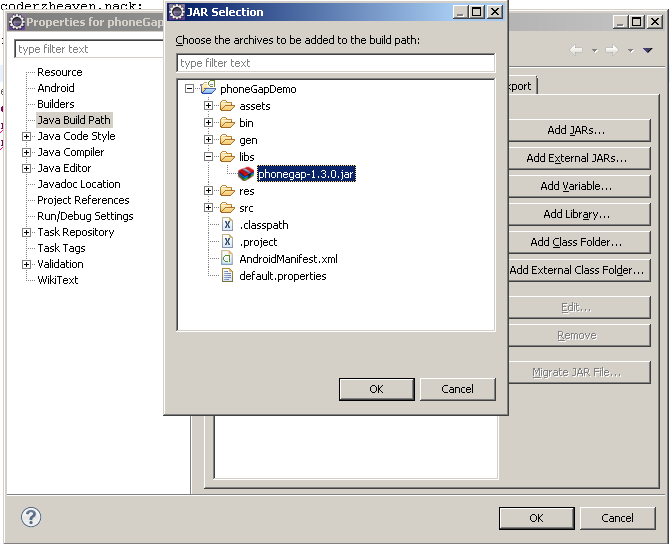 3.Open eclipse and create a new project named “phoneGapDemo” as shown in the screenshot below. 5.Now create a file named “index.html” inside “www” folder and copy this code into it. 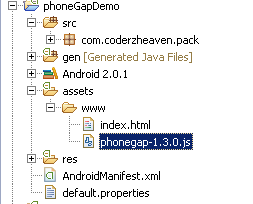 6.Copy the “phonegap-1.3.0.js” file inside the “www” folder as shown in the screenshot. 7. Create a folder named “libs” inside the project root folder and copy the “phonegap-1.3.0.jar” inside this directory from the zip you downloaded from the above. Now add this jar to the build path. Right Click on the project folder and click “Build Path” and add jars and locate the jar inside your project and click ok.
8. Now create a folder named “xml” inside res directory and create two xml inside it. Now go on and run it. 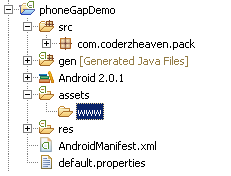 You just created a helloworld application with HTML for android using PhoneGap. I have added phonegap.jar file in to my libs folder but when I try to create an new xml files of (stated as in step 8 above). I donot find any phonegap as ResourceType. so how can I add that xml files. Please tell me how can I do this? 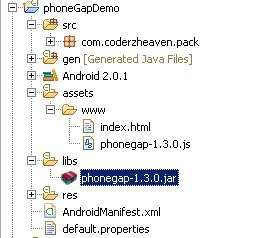 Thanks for finally talking about > Starting PhoneGap for ANDROID. | CoderzHeaven < Liked it!